This past fall, more than 50 Washington, D.C. professional theatres participated in the momentous Women’s Voices Theater Festival, showcasing more than 50 world premiere plays by women. In the spirit of the festival, Shakespeare Theatre Company started a blog series to highlight some of its Women in Charge. As part of STC’s efforts to continue the mission of this season’s Women’s Voices Theater Festival, we would like to keep producing our STC Women in Charge blog series. Theatre is a collaborative art, and a successful production involves stage managers, scenic designers, administrators and grant writers, costume designers, prop masters, trainers, and so many more. That is why we are taking this opportunity to highlight some of our women behind-the-scenes who keep our theatre, and the art form, alive. During the 2015–2016 season, we will be publishing interviews with some of the women you will not see onstage, but who keep STC running smoothly. We’re proud to put these wonderful women in the spotlight! 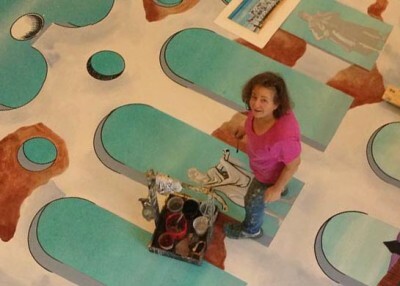 We hope you enjoy this next installment, featuring STC Charge Scenic Artist Sally Glass. How long have you been working in the arts? I’ve been an artist “wannabe” since I was six when my drawing of bunnies and Easter eggs made the elementary schools’ art exhibit display at the local Woolworth’s store. I’ve been paid for painting scenery for…umm…well…let’s say since curly perms and wide shoulder pads. What’s your favorite show that you have helped make happen? Why? Can you explain your role in the theatre world, for those who might not know? As Charge Scenic Artist, it is my responsibility to interpret the visual information any set designer gives us and to develop the methods by which we create the surface treatments for all the scenery seen on stage in its full size, live, and in person form. The design information could be in the form of a tiny painted model, carefully painted watercolors of each wall, photographic research, verbal descriptions, the classic scribble on a cocktail napkin, a coffee cup from the designer’s kitchen, or a bottle of fingernail polish—or all of the above. I just need to make sure that the sculpting, texturing, and painting that we do on the plywood, steel, and muslin sticks to the scenery and not to the actors, can be walked on, or danced on, or climbed on, or fought on, or fondled as the case may be, and, hopefully, as the curtain goes up, transports the audience precisely to where the designer wants them to be with their disbelief suspended way up in the grid. What do you love about STC? First of all, I adore the people I work with every day. I have enjoyed the painters that have joined me over the years, the Scenery Department staff, and now the folks in the Props Department that have moved into the Scene Shop with us. It’s a convivial place to work even when sawdust and paint and time are flying. I feel like the Company tries to support high production values even though we are in an eternal struggle with scheduling and money to fund those values. Money, of course, usually has a direct correlation to quality. Often, though, for the craft of scenic art, time is the most valuable commodity used to raise the quality of our product. When we have been able to afford it, I have appreciated the time allowed me to experiment and refine the techniques we have used on STC’s scenery. Many shows would have looked far, far less convincing or lovely if we hadn’t had that time to get it as refined as we did. For that, and the generous moral support from the rest of the staff, I am forever grateful.